Parc Drae is to be found tucked away in the centre of the village of Stithians, adjacent to the owners' property, Amazon. As we are "next door" we are able to ensure that the property is presented to our exacting standards. It is well placed for both coasts of the County and has easy access to the City of Truro as well as Falmouth, Helston, Redruth & Camborne. 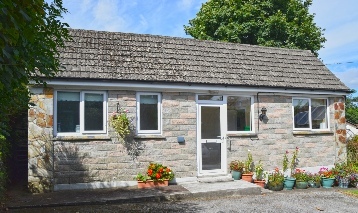 Cosy, comfortable, well equipped self catering Accommodation for two, whatever the time of year. Heating, lighting, linen and towels included in price. Heated from autumn to spring - not just when occupied. Secluded location but central for village amenities. Well placed for both the North & South coasts of Cornwall. Sorry no dogs or smokers. For more detail and pictures of the inside of the property please select the About Parc Drae tab.